The triple top pattern that we mentioned in the previous report “Topping over, tapping out” failed to materialize and instead, we saw how the US equity market rebounded off the Brexit lows and broke new record highs. Nonetheless, our bearish view remains firmly rooted as the fundamentals showed further signs of deterioration. In this report, we will be using the S&P 500 index as the proxy for the US Equity market and analyze how the following macro indicators behaved during crisis recessionary periods. We notice a very telling pattern in the GDP Year on Year (YoY) change chart. The data go as far back as 1948 and it has 100% accuracy of forecasting a recession. The 1% mark appeared to be the critical dividing line between a healthy economy and one that is entering into a recession. From the chart above, every single time when the GDP YoY change falls below the 1% mark, the US economy is either already in a recession shown by the highlighted region or gradually heading into a one. 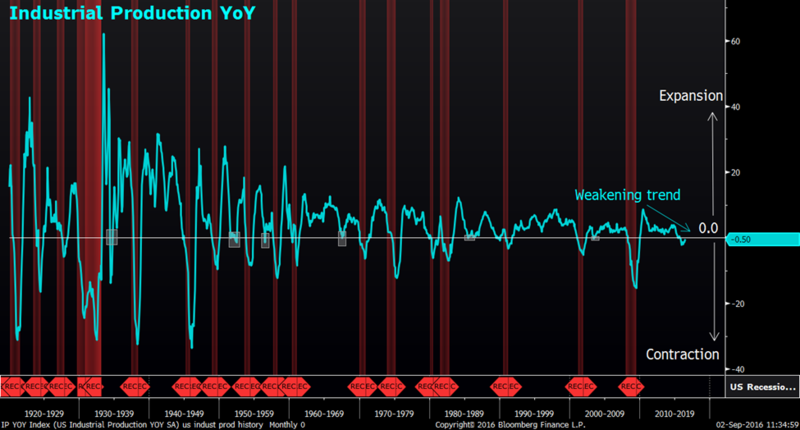 In other words, the slowdown in the growth of the GDP YoY change is evident in forecasting a looming recession. Since 2015, GDP has been slowing down sharply from a growth rate of 3.3% to the most recent 1.2% for Q2 2016. Watch out further subsequent GDP data releases to see if the downward trajectory continues or not. The drop below the 1.0% mark which is not too far away should warn us that a recession is around the corner. Breaking down the GDP into its smaller subset, we took a look at the GDP Investment component and found something interesting. The GDP Investment Quarter on Quarter (QoQ) change seemed to be able to predict some sort of a market correction. Looking at chart 2, the top panel depicts the S&P 500 Index while the bottom panel depicts the GDP Investment QoQ change. There is a strong positive correlation between the S&P 500 and the GDP Investment QoQ change. During the Dot-Com crisis, the GDP Investment QoQ peaked out perfectly in line with the S&P 500 in Q2 2000. 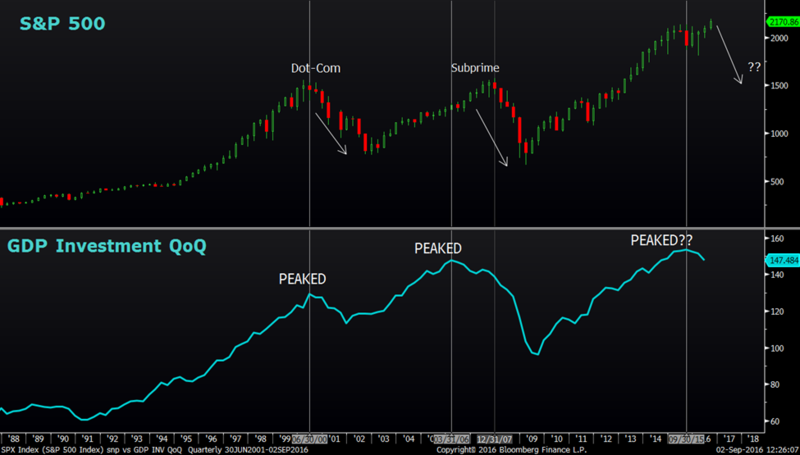 During the Sub-Prime crisis, the GDP Investment QoQ peaked out around Q1 2006 while the S&P 500 only peaked out around Q4 2007, giving investors ample time to prepare for a massive market correction. Looking forward, the GDP Investment QoQ seemed to have found a peak back in Q3 2015 and it has trended lower since then. If the Q3 2015 peak holds true, there is a high chance that the S&P 500 could be heading into a massive correction in the near future. Looking at the manufacturing side of the equation, chart 3a above shows a bleak future as the Industrial Production YoY trend continues to weaken. 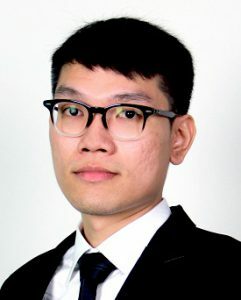 Industrial production measures the output of industrial establishments in the mining and quarrying, public utilities and manufacturing industries and is often regarded as a leading indicator of economic health. The study on the Industrial Production YoY goes as far back as 1920. Every time when the Industrial Production contracted, dropping below 0, the economy is either already in a recession or heading into one. In total, there were 23 periods of contraction and 6 failed (July 1934, April 1952, July 1956, July 1967, July 1985, June 2003) to call for a recession shown by the highlighted box implying an accuracy rate of 73%. Taking a deeper look into the failed signals, we found out that the longest duration of contraction was only 4 months in both 1934 and 1952 periods while the rest were only 1 month of contraction. With that in mind, the current count of Industrial Production contraction stands at 11 months which clearly suggests a high degree of certainty that the US economy is gradually slipping into a recession. To show the implication of how the Industrial Production is going the affect the market, we overlay the S&P 500 onto the chart. The results showed S&P 500 crashed alongside with the Industrial Production as it falls below the 0 level back in 2001 and 2008 and subsequently accelerated the stock market crashes. 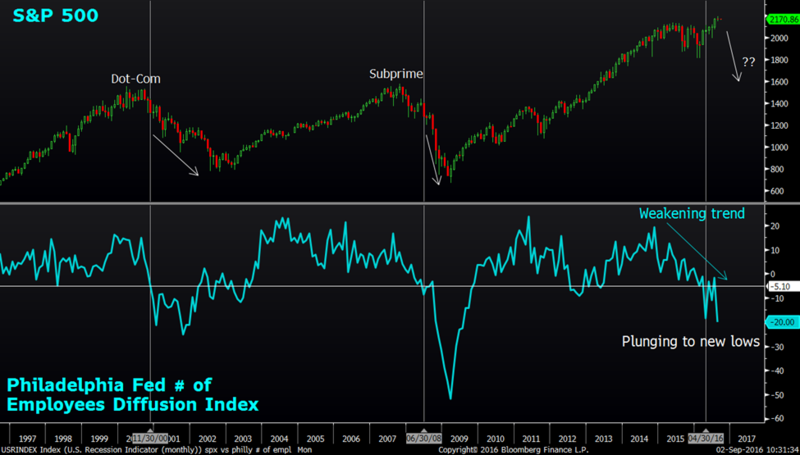 Fast forward to current time, the Industrial Production YoY change has been contracting for the past 11 months on a YoY basis and it first dipped below the 0 level back in June 2015 suggesting that a huge market correction is imminent. The ISM Manufacturing PMI is also signing the same tune. The PMI Surveys track sentiment among purchasing managers in the manufacturing industry and a reading above 50.0 indicates industry expansion while a reading below 50 indicates contraction. It provides quite a good indication of where the S&P 500 might be heading as we notice how the ISM Manufacturing PMI tend to slip below the 50 level first before confirming a market crash. Notice how the ISM Manufacturing PMI slipped below the 50 level back in June 1998 and January 2007, a few months before the respective market crashes. 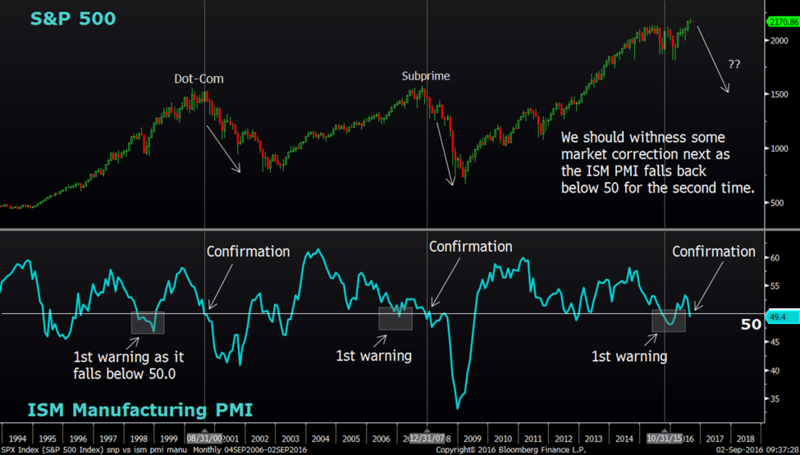 The confirmation of a market crash was seen by the PMI subsequently falling back below the 50 level again the 2nd time in August 2000 and December 2007 respectively. The current picture resembles the previous 2 market crashes in a similar fashion as the PMI fell below the 50 level back in October 2015. That was the first warning sign of a weakening economy and the PMI managed to make a slight rebound back above the 50 level subsequently. Ultimately, the weakness persisted and the most recent reading took the PMI back below the 50 level to 49.4 for the month of August, confirming the bearish narrative. We should be expecting an impending market correction soon. Moving on to the consumer side of the equation, Retail Sale seemed to be doing badly too. Retail Sales YoY growth peaked out way earlier in 2011 and has trended lower since then. Basically, retail sales track the resale of new and used goods to the general public, for personal or household consumption. In hindsight, the 1.6% level proved to be a crucial number to watch. 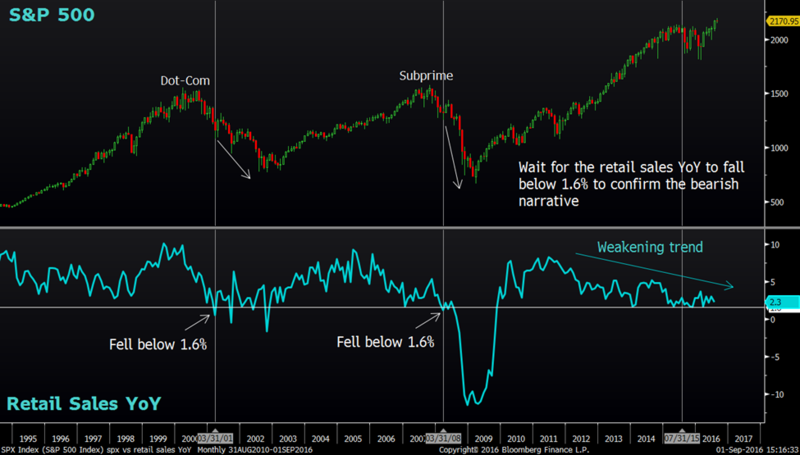 As the Retail Sales YoY growth fell below 1.6% back in March 2001 and March 2008, it sped up the market crashes in the Dot-Com and Subprime Crisis respectively. The last reading of the Retail Sales YoY change stands at 2.3%. A fall below 1.6% should provide us the signal that a market correction is underway. The NYSE Margin Debt figure is the total amount debit balances in the customer securities margin accounts held at the NYSE member firm. Simply put, the margin debt is the fuel that moves the market and it has a strong positive correlation to the S&P 500. We can see how the topping over pattern in the Margin Debt spelled out the market crashes back in 2000 and 2007 respectively. The Margin Debt seemed to have peak over once again in April 2015 suggesting a market correction is looming. 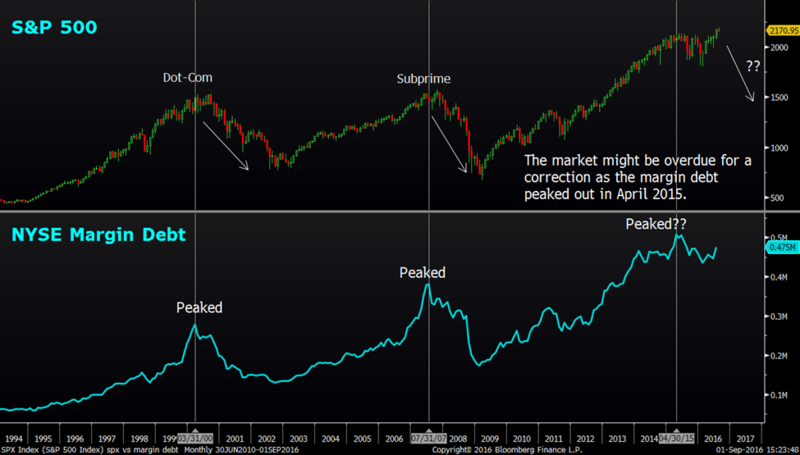 Look out for the NYSE Margin Debt to continue the downward trajectory to confirm the April 2015 peak. The Adjusted EPS index measures the S&P 500 company earnings as a whole and it is based on income from continuing operations excluding gains, charges and one-time items. The correlation of the Adjusted EPS to the S&P 500 is pretty similar to the NYSE Margin Debt where the peak of the Adjusted EPS brought about the subsequent market crashes. It held true for both Q1 2000 (Dot-Com Crisis) and Q2 2007(Subprime Crisis). The Adjusted EPS appeared to have peaked over once again in Q3 2014 and the S&P 500 is overdue for a market correction if the correlation holds. Looking at the headline employment number, Non-Farm Payroll (NFP), things appeared fine as the economy added more jobs recently in the acceptable range. 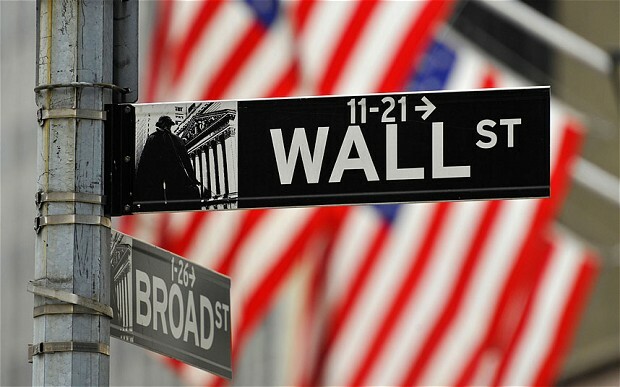 The NFP bounced off from a low of 24, 000 for the month of May to a reasonable 151,000 jobs for the month of June. However, the other labor market indicator such as Unemployment Rate, Labor Market Condition Index (LMCI) and Philly Fed number of employee diffusion index suggest otherwise. During good times, NFP tend to add 44,000 jobs on lower bound and 376,000 jobs on the upper bound. Things start to look ugly when the NFP dips below the -15,000 mark, suggesting a net loss of 15,000 jobs on a monthly basis. That was exactly the case during the Dot-Com and Subprime Crisis where the S&P 500 formed their respective tops. 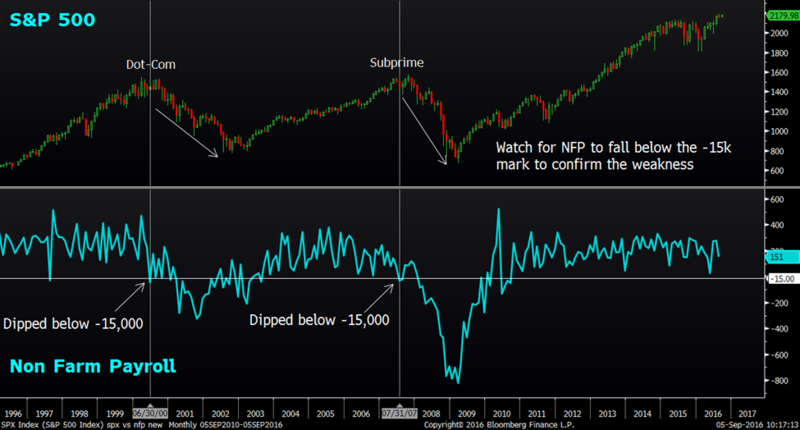 Moving forward, look out for the NFP to fall below the -15,000 mark to reaffirm the market correction thesis. This is yet another indicator with high degree of accuracy in terms of forecasting a recession. This study traces as far back as 1948 and we overlay the 12 month moving average onto the US Unemployment rate chart. As the Unemployment Rate ticks up above the 12 month moving average and forms a bottom, the US Economy tends to enter into a period of recession. 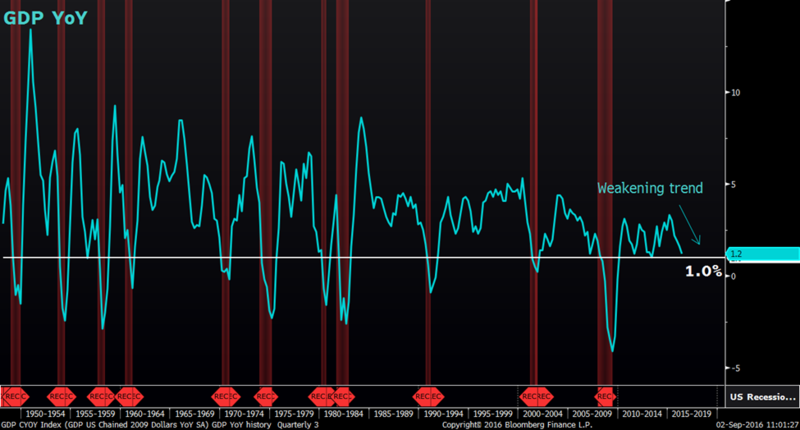 Since 1948, there were a total of 14 instances where the Unemployment Rate crossed above the 12 month moving average. Out of which, 4 failed (Nov 1962, Nov 1976, June 1985 and April 1995) to call for a recession shown by the highlighted boxes and 10 successfully predicted a looming recession. That implied a 71% accuracy. We have seen how the Unemployment Rate behaved recently where it bounced off the 4.7% mark for the month of May to 4.9% for the month of August suggesting a change in trend. 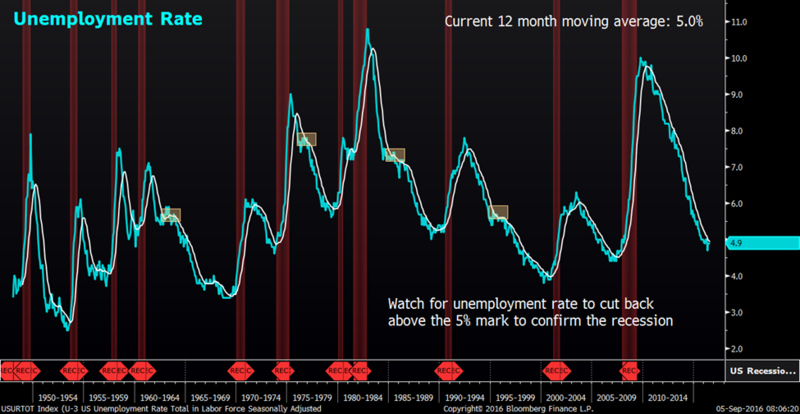 The important thing to look out for moving forward is for the Unemployment rate to edge up above the 12 month moving average which currently stands at 5%. When that happens, it should provide us with an early warning that the US economy is heading into a recession. The Philadelphia Federal Reserve survey diffusion index numbers of employees is part of the monthly survey of manufacturers in the Third Federal Reserve District. The survey’s indicators of employment plunged into new depths for the month of August as it fell 18 points to -20.0 which is the largest negative reading for the year. This shows a huge disparity from the healthy Non-Farm payroll data. The past 2 occasions when the Philly Fed employment survey diffusion index fell below -5.10, it was greeted by some serious market correction. It happened during both the Dot-Com and Subprime crisis period. Currently, the index is hovering near the recessionary period lows again at -20.0, warning for some possible market correction. The Federal Reserve Labor Market Condition Index is a good representation of the health of the US labor market as it takes into account 19 monthly labor market indicators. The LMCI is showing some weakness as well with the index falling below -2.2 for the month of February. 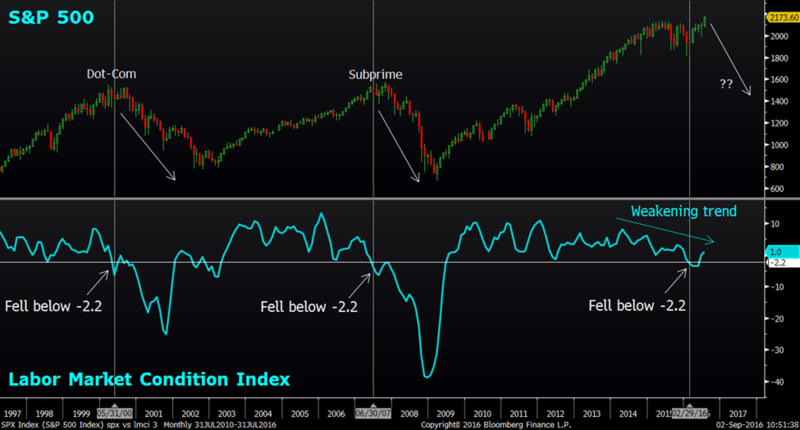 We have seen how the LMCI actually signaled for massive market corrections when it contracted below -2.2 back in May 2000 and June 2007, well in line with forming the respective market tops. Currently, the LMCI has somewhat recovered marginally as it bounced back above the negative region to 1.0 for the month of July. However, the trend remained weak and the current picture looks eerily similar to the 2000 and 2007 episode. Look out for the turnaround below -2.2 to confirm the weakness in the underlying labor market where some market correction should materialize. In conclusion, we have presented a lists of macro indicators to show the underlying weakness within the US economy and how they have behaved during crisis periods. Some have confirmed the bearish narrative while others are about to confirm. The table below shows the respective figures that we will be closely monitoring moving forward for the different set of macro indicators. 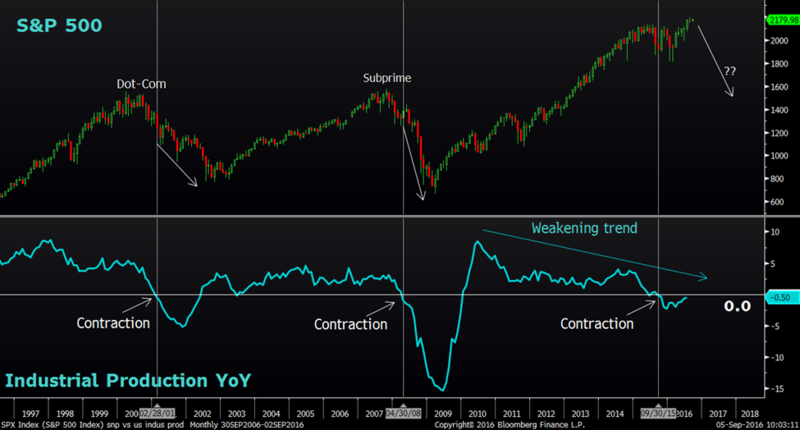 Once the rest of the indicators especially the GDP YoY and Unemployment Rate indicator confirm the bearish signal, there will be a higher likelihood of a sharp market correction.